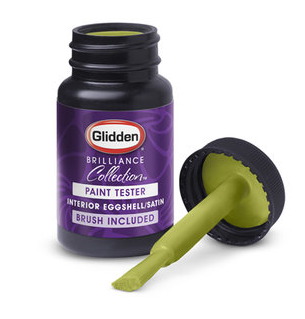 Remember those Glidden Testers I was contemplating? Who thought I would pick the Spanish Olive? Me, too! Green is my favorite color, particularly pea soup green. 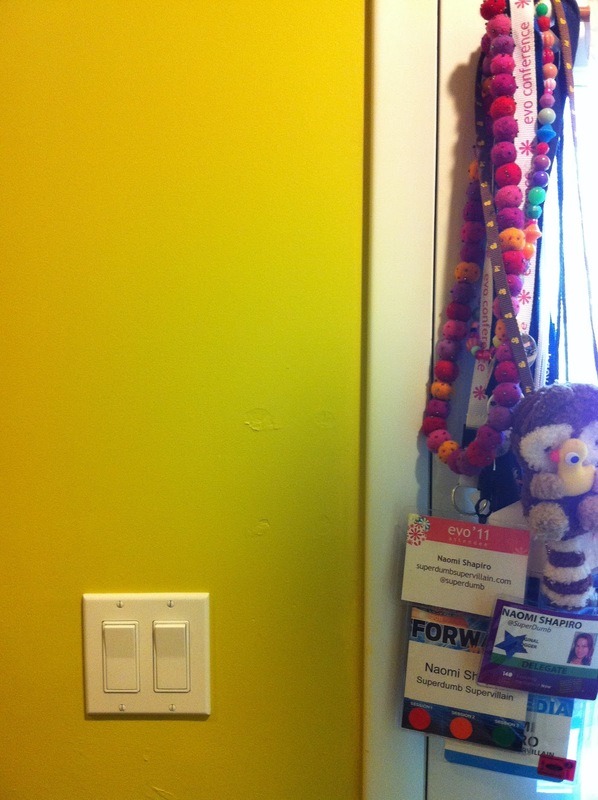 Since my challenge was to break the color rules, however, I opted to forego the obvious. I loved the darker swatches but my office is pretty small with just one small window and I didn't want it to feel even smaller. 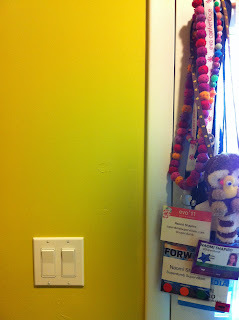 In the end, I decided to go with the yellow: Glidden Extra Virgin Olive Oil. 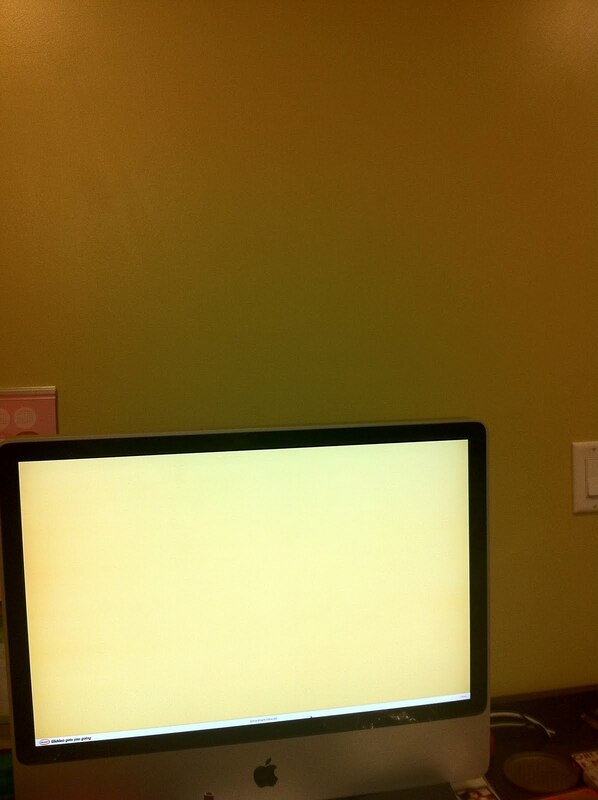 I thought the sunny color would open up the room and maybe even perk me up a little. It's a pretty drastic change, right?! I absolutely LOVE it. The color is a bit hard to photograph- I tried to take a photo of the full-screen paint selector from Glidden.com but the color is so bright that it throws off the digital camera's light metering. Heh. 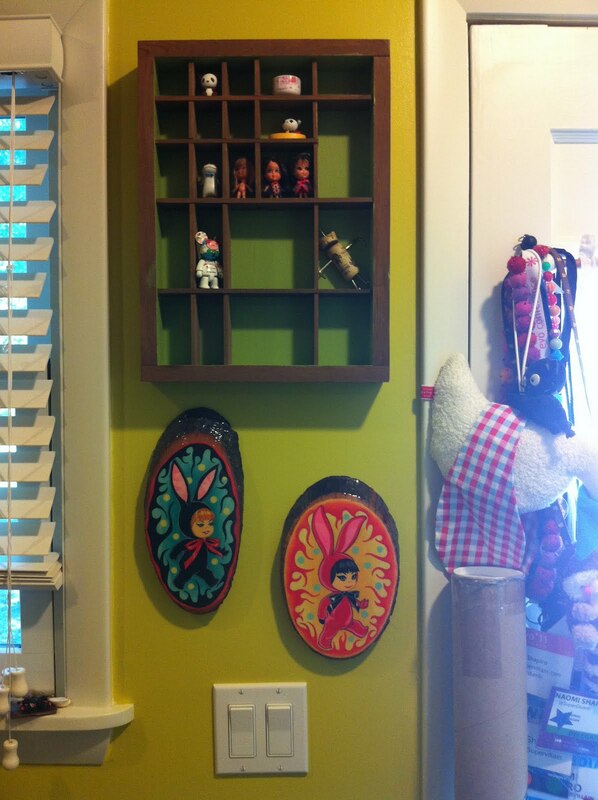 I love how it looks with my Russel Wright vintage folding chairs and thrift store paintings. I need to hang them and get a bunch more out of storage. The new color is making me giddy about decorating again. Check it out, I even put up some whimsical birdie decals! And my computer nook, where all the magic happens. Kind of. I am really enjoying how non-neutral my walls are and how the color makes everything pop. Wondering how the other Social Fabric community members took on the Glidden challenge? See everyone's results on the Glidden Testers website or search the hashtag #GliddenTesters on Twitter. So this is the room where we "chat" with each other (my mind was saying "where the magic happens" as I was reading this, but then you actually wrote it in the post). I love the color, though I'm guessing it's not so neon as it is in the photos. I love greenish yellow tones. Great work! And your artwork rocks. Oh Natalie, I absolutely adore the color choice AND the whole new festive feel of the room. Just think of how much MORE creative you will be. And you'll be SMILING a lot! Awesome! Love the boldness of the color! Great job. 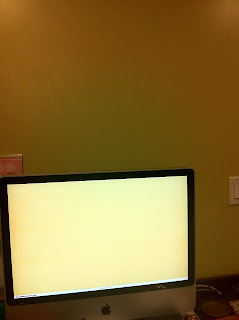 I'm a huge fan of yellow, which is why my home office is a buttery shade. It's so happy all year long. Great great job and thanks so much for sharing.